The free fall of the Fighting Illini football ultimately resulted in the inevitable happening, and that was the firing of Ron Zook as head football coach. After starting the season 6-0, including narrow wins over Arizona State, Western Michigan, and Northwestern, the Illini have since dropped 6 straight games, the last setback in this streak being a 27-7 loss to last place Minnesota on Saturday at TCF Bank Stadium in Minneapolis. This was perhaps the final nail in Zook's coffin, as once again the Illini offense looked positively dreadful, leading new athletic director Mike Thomas to make the decision to remove Zook as Illini coach. So, during the Illini basketball game on Sunday against Chicago State (more on that game later), news began circulating throughout the Assembly Hall that Zook had indeed been fired and that Thomas would be addressing the media, thus making it official. Zook himself also made a statement regarding his firing, but wouldn't take any questions from the media in attendance. Thomas had said prior to the firing that he intended to assess the program and Zook's future after the regular season was over, and also that he would examine the "entire body of work", not just this season. Thomas mentioned that a change was necessary to move the program forward, and also said that if he was making a decision about character, then Zook would have had a lifetime contract. But, character doesn't win games or put fans in the seats, so the decision was pretty much a foregone conclusion. Zook compiled a 34-51 record over his 7 seasons in Champaign, including taking the Illini to 2 bowl games. The Illini are still bowl eligible this season as well, so you can actually say that Zook coached the team to 3 bowl games, although he won't be leading the team in this year's game. That honor falls upon defensive coordinator Vic Koenning, who takes over as interim head coach while a replacement for Zook is found. Unlike his predecessor, Thomas plans on using a search committee to find the next coach. Former athletic director Ron Guenther commonly would be a search committee of one, thereby getting "his man" all by himself. So, where does this leave the football program? As was previously mentioned, attendance is falling as quickly as the Illini's bowl placement. If there is one coach on the current staff that is capable of leading the team through this transition, Koenning is definitely the one for the job. You could argue that Petrino is the better fit, but just look at the offense over the past few weeks and all of a sudden he doesn't look so attractive in leading the team. Earlier in the season when speculation began that Zook might not be retained as coach, many people were wanting Petrino to be the successor, based solely on his name and reputation at Arkansas under older brother Bobby. That scenario doesn't look nearly as good now, and whether or not Koenning remains on the staff when the new coach is hired is anyone's guess right now. After all, he has head coaching experience at Wyoming and with so many jobs currently opening within the past week, would like to find somewhere to possibly coach again as well. Is is assumed that the Illini will be invited to a bowl game, but that is still uncertain where that destination will be. Stay tuned. Much better news on the men's basketball front, with Bruce Weber's squad capturing the Cancun Challenge title with a 63-59 over in-state rival Illinois State. The Illini followed up that title with an easy win over Chicago State 90-43 on Sunday afternoon at the Assembly Hall. The lopsided win gave Weber a chance to play some of his younger players for considerable minutes, and one freshman in particular, Myke Henry, took full advantage of it. Henry scored 14 points to lead the Illini after coming off of an ankle injury at the start of the season. Such a performance is refreshing to see for this group of players, mainly because they are so young. On Tuesday night, the Illini traveled to Maryland for their first true road game of the season in the Big 10/ACC Challenge. The Illini prevailed in that game 71-62, behind a strong game by senior transfer Sam Maniscalco, who had 24 points. Maniscalco was clutch down the stretch, as he connected for 5 of 8 shots from beyond the arc, as well as made all 7 of his free throws. Brandon Paul also had a good game for a change, scoring 17 points to help lead the Illini to the victory. For the first time since the 2008-09 season, the Illini have started the season 7-0, but have a challenging stretch of games coming up before the start of the new year. The first real test comes this Saturday when Gonzaga pays a visit to the Assembly Hall (2:15 pm CT, ESPN2). News isn't as encouraging on the women's basketball front, as Jolette Law's squad has endured a rough stretch of games to start their season. The Illini are just 2-5 so far, and dropped both games at the San Juan Shootout in Puerto Rico, falling to Green Bay 82-62 and Arizona State in a close one, 51-50. The Illini knew this would be a tough hill to climb since Law lost one of her better players to an ACL tear before the season began. With Centrese McGee out, players like Karisma Penn and Adrienne GodBold will need to step up. The women will participate in the ACC/Big 10 Challenge on Thursday when they travel to Clemson, South Carolina to take on the Clemson Tigers at 6:00 pm. The Illini will not return to the Assembly Hall until December 28th. Not that it matters anyway, given the lack of fan support that they get. Kevin Hambly's Illini spikers were given the opportunity to host first and second round matches in the NCAA volleyball tournament. The Illini will face Central Michigan on Friday night, and the winner of that match will then take on the winner of the other match, which is Marquette and Western Kentucky. The Illini are the overall #3 seed in the tournament, and will feed into the Gainesville, Florida regional, which will be played next weekend on the University of Florida campus. Looking ahead, as I tend to do far too often, the Illini could match up with #2 Nebraska in one of the final four matches, should they get that far. The Good, The Bad, and The Ugly: The Illini version. This past weekend was a busy one on the University of Illinois campus. All the major sports were in action, either beginning regular season schedules, continuing seasons, or beginning post-season play. Here, in my own opinion, is a synopsis of the weekend. First, the good. And there is plenty of good to report from campus, as a couple of the women's sports teams are doing very well in their respective seasons. The volleyball team returned to their winning ways, taking down two ranked teams in the process in Penn State and Ohio State last weekend at Huff Hall. On Friday evening, the Illini defeated the Nittany Lions, becoming the first team to sweep them in the season series in quite some time. Likewise, the Illini beat the Buckeyes on Saturday night to improve their season record to 24-3 overall and 13-3 in the Big Ten. The #7 ranked Illini are now just one game off the lead in the conference race, and will be back on the road this weekend when they travel to East Lansing on Friday night to battle Michigan State and then further up the road to Ann Arbor on Saturday to battle the Michigan Wolverines. Last Sunday afternoon, the Illini women's soccer team began NCAA tournament play at home and defeated the defending champions Notre Dame 1-0 to advance to the second round of the tournament. In a very blustery wind, Niki Read scored the only goal of the game, and sent the Illini on to victory. The #16th ranked Illini will now travel to Stillwater, Oklahoma to battle #4 Oklahoma State, who is seeded #2 in the region on Friday evening at 5:00 pm. Auburn and Maryland are also in the regional pod, with the winners meeting on Sunday for the right to advance further still in the tournament. Bruce Weber's Fighting Illini basketball team began the regular season this past Friday evening, and for the week thus far, have won their first two games, although they may not have been as convincing as one might have expected. The Illini beat Loyola-Chicago 67-49, then began the U.S. portion of the Cancun Challenge by taking down SIU-Edwardsville 66-46 on Monday evening at the Assembly Hall. D. J. Richardson tied a career high in points with 20, and Tyler Griffey notched his first double-double of his young Illini career with 10 points and a career high in rebounds with 14. The severely undersized Cougars hung tough with the Illini for a good portion of the game, before their size and athleticism finally wore their guests down. With such a young team this season, Weber has been trying different lineup combinations, but injuries have limited him so far. Among the players that have missed at least one game since the season began have been Sam Maniscalco, Myke Henry, and Devin Langford. Crandall Head, who is currently serving a four game suspension for an off-court incident, is set to return when the Illini face the Bisons of Lipscomb University on Thursday night (8:00 pm, CT BTN) at the Assembly Hall. The game against Lipscomb is another contest in the Cancun Challenge. Then, the Illini will head to Mexico to finish the challenge when they play the Richmond Spiders the week of Thanksgiving. Even though the Illini women's basketball team has started the season 2-1, I file them in the bad category mainly because of the lack of attention that this program has. After a season opening loss to South Carolina last Friday afternoon, the Illini have bounced back to defeat Cleveland State on the road and Memphis on Tuesday night 62-54. The main issue here are the crowds at Assembly Hall. Often times, you can physically count the bodies in attendance, and the level of play doesn't seem to be helping this matter any. Coach Jolette Law keeps saying that she is going to get things turned around, and every year she is at the helm it doesn't seem to get any better. The Illini now embark on what turns out to be a nine game road trip, since they won't be playing back at the Assembly Hall until they host Alabama A & M on December 28th. The Illini will next be in action on Friday night when they take on the Oregon Ducks in Eugene, then Sunday when they battle the California Bears in Berkeley. The state of the Illinois football program gets both a bad and an ugly tag, and to differentiate between the two, I will describe them separately. First, for the bad of the equation. The Illini dropped their fourth straight game after winning their first six games to become bowl eligible, and to make matters worse, it came at the hands of the Michigan Wolverines 31-14 as the Illini offense once again didn't fare very well at all. Pressure is mounting for Ron Zook in more ways than one during this losing streak, and it appears that it is finally getting to the coach. On two separate occasions this week, Zook has spoken to the media and the topic about his future as Illinois coach has come up both times. On Monday, a reporter grilled Zook about his future, and was told that this wasn't the time to bring that up. Then, at his weekly gathering with the press on Tuesday, he stated up front that this wasn't about him or about his future, and if anyone wanted to broach the issue with him, then he would be done for the day. Well, the subject was brought up about 18 minutes into the press conference, and that was the end of that. The Illini will face Wisconsin (11:00 am CT, ESPN2) on Saturday in the final home game of the season. It also marks Senior Day for 15 Illini players that will be playing their final home game at Memorial Stadium. The question is, will this be "Senior Day" for Ron Zook as well? And now, for the ugly. This has been a very bad week for Illinois football, both on and off the field. There have been a couple of incidents that occurred after the game on Saturday that has really marred this program. First of all, senior Trulon Henry was shot in the hand after he returned to a party to get some younger players away from the scene. Henry, who will miss the remainder of the season and possibly the bowl game if the Illini get an invite, was the innocent victim of being in the wrong place at the wrong time. Then, to make matters worse, two freshmen wide receivers were arrested in a separate incident earlier on Saturday evening. Kenny Knight and Jordan Frysinger attempted to run from the scene on Green Street, but were apprehended by police before they could get very far. I don't know what this says about the speed of our receivers, but if they cannot outrun the police, then maybe they don't deserve to be on the football team. Still, these two incidents cast a darkened shadow on a program that has fallen on hard times in the last month. This cannot help Ron Zook's quest to stay on as Illinois coach, and only an upset win against Wisconsin and a season ending win at Minnesota might be the only thing that saves him at this point. Just sayin'. Now that the Fighting Illini's bye week has come and gone, it is once again time to begin focusing on the stretch run, what has now become a 3 game season, and quite possibly, could determine the fate of Ron Zook. 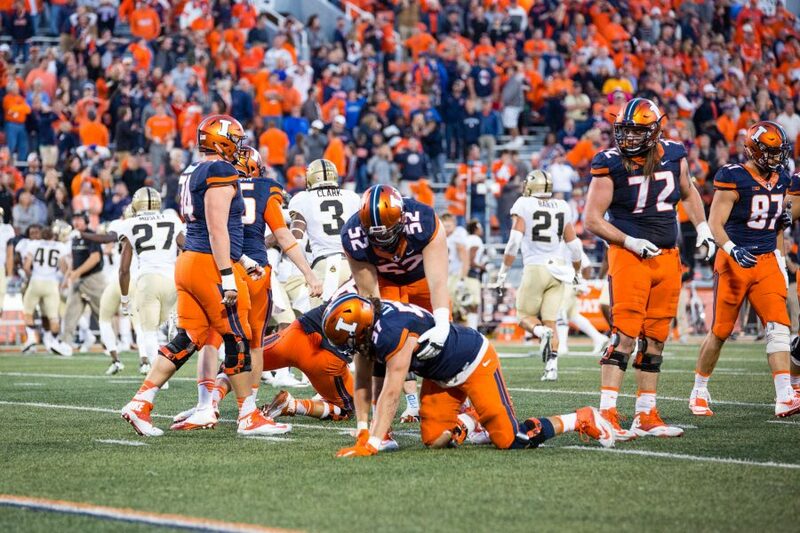 After getting off to a 6-0 start to begin the season, the Illini have fallen back to reality, losing their last 3 games and come off their bye week at 6-3 overall and 2-3 in the Leaders Division of the Big Ten. At Zook's weekly press conference on Tuesday, he talked about the team needing the break. Given the circumstances, this game is a very winnable one, and could go a long way in determining how successful the Illini will be in 2011. The team had such high hopes once they got out to that 6-0 start, but have fallen on some hard times as of late. The Illini will welcome Michigan to Memorial Stadium this Saturday (2:30 pm CT, ABC), and the Wolverines will be coming into Champaign reeling themselves, losing at Iowa 24-16 last Saturday. If you remember how the Illinois-Michigan game went last year, there were a record number of points scored, as the Wolverines defeated the Illini in a basketball score 67-65. Zook doesn't think that there will be nearly that many points scored this year, but feels that it will still be a close game nonetheless. For the Illini, win this game and you might be able to salvage your season. Lose, and it could spiral things downward even further. It's just that simple. Bruce Weber's Fighting Illini basketball team finished the exhibition portion of their season on Monday night, with a 79-45 win over Quincy University at the Assembly Hall. Junior D. J. Richardson paved the way by scoring 17 points, including 4-6 from beyond the arc. The win over Quincy was a chance for Weber to see some different lineup combinations and get some last minute tweaks done before the season opener on Friday night against Loyola-Chicago (8:00 pm, CT). The game against the Ramblers will not be televised, but will be available on the internet at btn.com. On Wednesday, Weber announced that he has signed one player for the 2012-13 season, a very small class compared to the one that came on this season. The player, Michael Orris, is a point guard, and will back up freshman Tracy Abrams, and could possibly even see the court with Abrams. Orris had originally committed to Creighton, but had second thoughts about his decision and since the Illini had shown interest from the beginning, the family switched and Illinois was the destination. Jolette Law's Illini women's team won their first and only exhibition game of the season, a 79-52 victory over Maryville on Tuesday night at the Assembly Hall. The Illini were led in scoring by freshman Ivory Crawford with 14 points, while Lydia McCully and Karisma Penn each tallied 13. The Illini will open their season on Friday afternoon at the Assembly Hall when they welcome the Gamecocks of South Carolina (3:30 pm CT). Law announced two signees to the program on Wednesday, Mckenzie Piper, a 6'0 guard from Iowa City, Iowa and 6'3 forward Nia Moore from Bolingbrook, the same high school that freshman Taylor Tuck went to. The Fighting Illini women's volleyball team got back on the winning track last Saturday evening in Bloomington, Indiana, as they defeated the Hoosiers in 4 sets. Illinois is 22-3 overall and 11-3 in the Big Ten, and will come back to Huff Hall to host a couple of matches this weekend. The #5 Illini will host perennial conference foe Penn State on Friday night, then will welcome Ohio State on Saturday evening. Coach Kevin Hambly announced the signing of two players for the 2012-13 season on Wednesday, those players being Maddie Mayers of Ft. Wayne, Indiana and Alexis Viliunas of LaGrange, Illinois. Viliunas, who has a brother Eddie that is a tight end on the Illini football team, is a setter that should fit into the mold of the team very well. The Fighting Illini women's soccer team completed the Big Ten Tournament in style, winning the tourney and getting the automatic bid to the NCAA Tournament as a result. The Illini defeated Ohio State in double overtime on penalty kicks, then knocked off Michigan State 1-0 in the semifinals before beating Penn State 2-1 to capture the championship. Both the semifinal match and the championship game went into overtime as well, adding to the suspense and excitement. As a result of their success, the Illini will host a first round game at the Illini Soccer Complex on Sunday at 1:00 pm CT against Notre Dame. The Illini come into the NCAA Tournament at 16-4-2 overall and finished the Big Ten season at 8-2-1. Finally, with all of the news that has been breaking in Happy Valley concerning the scandal over the past few days, I would be remiss if I didn't give my views on the situation. The ordeal surrounds the Penn State football program and a former assistant coach who did some horrific things. As a result of all of this, legendary coach of the Nittany Lions Joe Paterno has announced that he will be retiring at season's end, but with everything that is coming out regarding this situation, it appears that he should step down immediately. As one who has talked to Paterno over the past few years, I admit that I have had some admiration for the man who has coached in State College for the past 46 years as the head man. Details are still coming out about the scandal, and the more that is revealed, the less that admiration becomes. It appears that Paterno knew what was going on, but never followed up on his reporting of it. We still don't know who knew what, how many people were involved, or what this will do to the legacy of the long-time coach. What I do know is that this scandal overshadows the tattoo-gate in Columbus, and far surpasses the booster scandal in Miami. I don't know what else I can say about it at this point. Much more will be coming out in the days and weeks to come, but we may never get to the actual bottom of it, or what it will eventually do to the school and its administration. Good time for a bye week? The spiral continues for the Fighting Illini football team, as they dropped their third consecutive game, this time to Penn State 10-7 during a snowstorm that plagued the eastern United States last Saturday at Beaver Stadium in State College, Pennsylvania. After the 6-0 start, which now seems like a distant memory, the Illini are now 6-3 and have an extra week to think about the loss to the Nittany Lions and also to prepare for their next game, a home contest against the Michigan Wolverines. The offense, which looked pretty good earlier in the season, seems non-existent at the moment, and Saturday was no exception. Jason Ford did rush for 100 yards on 24 carries, while quarterback Nathan Scheelhaase tallied 89 yards on the ground. Scheelhaase only completed 9 of 16 passes for 63 yards in the brutal weather conditions, but one of those passes was good for a touchdown to Spencer Harris. The Illini seemingly was driving to win the game late, but instead got into field goal range and tried to tie it with a kick by Derek Dimke. But, the attempt hit the crossbar, sending the Illini once again to defeat. This brings the Illini to their bye week, which probably couldn't come at a better time. It will give the Illini an opportunity to think about the last few weeks and then regroup for the stretch run, which is far from easy. They have 3 games left, including home contests against Michigan and Wisconsin, before ending the regular season Thanksgiving weekend at Minnesota. The first two games will be longshots to win, and since Minnesota beat Iowa last weekend, the Gophers will have much more to play for when they face the Illini in Minneapolis. Minnesota will not qualify for a bowl game, and will have nothing to lose when they take on the Illini. That will be, in essence, their bowl game. The Illini had better be aware of that fact and prepare accordingly, or else you might be looking at 6-6. Such a contrast to the view of the season just a few weeks earlier. Bruce Weber's Illini basketball team began exhibition play on Tuesday night, and not surprisingly, it was a bit of a struggle. Faced with quite a few new players this season, and also a couple injuries to deal with, the Illini were not at full strength. Transfer Sam Maniscalco, who came from Bradley, sat out this game because his surgically repaired ankle has been bothering him as of late, paving the way for freshman Tracy Abrams to run the offense from the point guard position. Fellow freshman Devin Langford also sat out the game, due to a broken finger sustained in practice last week. A late scratch was Mychael Henry, who injured himself in practice on Monday, did not play as well. Then, there is the latest disciplinary case involving Crandall Head. Stemming from an incident that happened in the off-season, Head has been suspended for the first four games, including the exhibition contests, for what Weber commonly calls "not taking care of his business". This could mean anything from not going to class, to a number of other issues. Apparently Weber is not freeing himself of these issues, given all the headaches that Jereme Richmond caused in his one season in Champaign last season. As for the game, sophomore Meyers Leonard led the way for the Illini with 18 points, as they defeated Wayne State (Nebraska) 79-51 at the Assembly Hall. I was particularly impressed with two freshmen, Nnanna Egwu and Mike Shaw. Egwu moves up and down the court as good as I've seen a big man do in an awfully long time, and as far as Shaw goes, he has tremendous potential. This team will take their lumps on occasion, but I do think that they will end up surprising some people as well. They finish up the exhibition portion of the season next Monday night, when they welcome Quincy University to the Assembly Hall, a game that is scheduled to tip off at 7:30 pm. Since the Illini women's volleyball team lost their #1 ranking at Nebraska two weeks ago, Kevin Hambly's squad has dropped 2 of their last 3 matches, the latest setback to Purdue 3-1 on Wednesday night in West Lafayette. Hambly has discovered that life on the road in the Big Ten is tough, especially when teams are out for you. The Illini are currently 21-3 overall and 10-3 in the conference, and will travel to Bloomington, Indiana on Saturday evening to attempt to get back on the winning track. Game time with the Hoosiers is set for 6:00 pm central time. It's postseason time for the Illini women's soccer team, as they are currently involved in the Big Ten Tournament. The Illini defeated Michigan in the regular season finale last weekend in Champaign, and advanced in the opening round of the tourney with a win on penalty kicks over Ohio State in Evanston. The Illini will play at 1:15 pm central time on Friday against Michigan State, a match that will be televised on the Big Ten Network.